It is simple. Too many young Native Americans are being left behind. 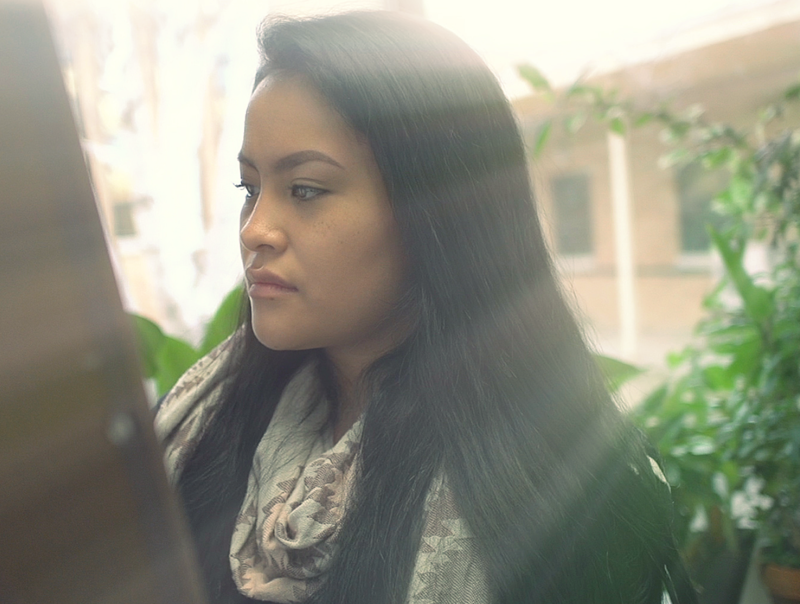 Native Hope sees these young people struggling to walk in two worlds: the Native world and the contemporary world. These are two very different places—especially in the world of education. Most Americans take for granted the accomplishment of receiving a high school diploma. 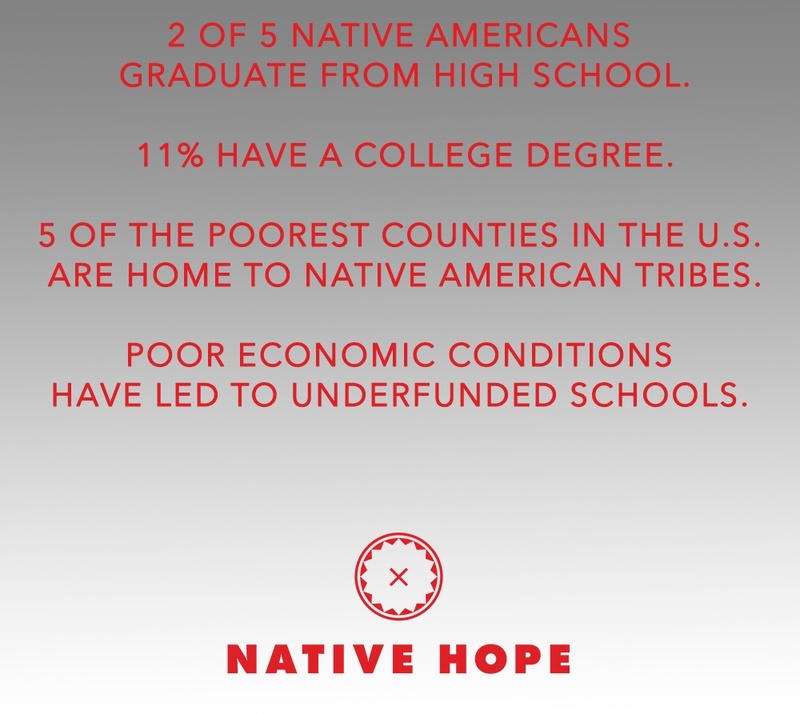 However, the sad reality for Native Americans is that only two out of every five of them will graduate high school. Post-secondary success rate is even more dismal with only 11 percent of all Native Americans earning a college degree. Although many Native American tribes are making great strides toward economic improvement on their reservations and for their tribes, there are many who continue to struggle. Many tribes in South Dakota live in poverty. Five of America’s poorest counties house Lakota, Dakota, and Nakota Sioux tribes. The average yearly income for those living on these reservations is less than $10,000. One tribe boasts an average income of $3,000 a year. This level of poverty simply should not exist in our country or in the world. Because of the poor economic situation, many Native American children attend underfunded schools. This means their educational opportunities are insufficient because the programming and teachers do not receive adequate funds. Another issue hindering the success of Native American students stems from a lack of early childhood education. When many Native American students reach the kindergarten classroom, they lack fine motor skills and face language deficits. When children are raised in poverty, early childhood development is often delayed. Simple skills that many five-year-olds possess like holding a crayon, looking at a book, and counting to 10 have not been developed. Letters and numbers are simply foreign to them. Language delays occur as a result of a lack of interaction with books. Other behavioral issues arise as well because of a lack of routine and stimulation that encourage intellectual growth. 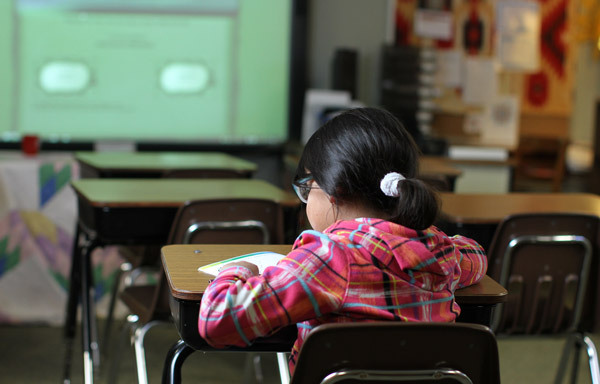 In order to combat these children’s deficits, the federal government has long used school funding for schools with high concentrations of children in need. These programs were cut in the federal government’s budget sequestration of 2013. The funds for Title I and Impact Aid, which serve our nation’s poorest children, have steadily been reduced from roughly $14.5 billion to $727 million. This deep cut has forced public and reservation schools alike to cut teachers, programs, and training. Prior to these budget cuts, many schools were making positive strides as a result of the funding. This leads to the final piece of the puzzle. The reservation is a culture within itself. It is home. How can a cycle be broken if its people fail to receive an education? This is an age-old argument faced by many. Tribe members often say, “Go get your education and come home to change this place.” However, leaving is much easier said than done. For most, the reservation is all they know. An article entitled “American Indian Students Lose Ground” found in Education Week features a video of a young man named Joshua from the Pine Ridge Reservation in South Dakota. He tells about his friend who has dropped out of school and is lost to a gang—drinking and doing drugs. Joshua, like so many young people on the reservation, does not see a way to move forward without an education. He knows the reservation holds few jobs and a high unemployment rate. Finding a job on the reservation really is like finding that needle in a haystack. Many reservations have an unemployment rate as high as 85-95 percent. This rate contributes directly to the high levels of alcoholism and drug use out the sheer absence of opportunity. The reality is that while many will encourage the youth to take that step toward gaining more education—there is a pull back to the reservation that is overpowering, regardless of the low employment opportunities. In order to lift a people, we must provide opportunities for high-quality education and a fresh way to do so. Native Hope wants to address this issue head on. We know that placing the power of possibility in the hands of young Native Americans inspires hope. Through having conversations and making connections, Native Hope believes that strides can be made toward improving the odds. It is our hope that solutions can be discovered by holding open, honest, and key discussions with young and old together. This will not be easy because it is always tempting to revert to the status quo. Education is evolving in our country, and we want to be a part of that evolution, no matter what it takes. To be successful, we must connect and partner with those who have innovative ideas, and we need to be willing to tell the stories of success as well as those of failure. Our goal is to raise a whole army of people working to provide the power of an education. Together, we can increase the number of Native Americans who graduate from high school and college. Together, we can help provide a hope and a future. 100% of gifts from people like you goes directly toward funding vital programs for Native American youth.